A full year since Dan Bejar released his 11th studio album under his Destroyer moniker — the underrated ken — the Vancouver musician abandoned his full-band setup for a solo tour. Appearing on a chilly and gloomy Monday evening, the Ottawa crowd made their way out in droves to the 27 Club for Bejar's first appearance in the city since 2014. Keeping the evening's proceedings intimate, former Deadly Snakes frontman André Ethier opened the show, backed only by a vintage drum machine. Clutching his electric guitar and musing through a 25-minute set, the Toronto musician relied heavily on material from his latest LP (and first in nine years), 2017's introspective and stark, Under Grape Leaves. Also ending his long hiatus from recording, Sandro Perri followed Either's set with the evening's noisiest performance. Seated on a wooden chair behind a rig of guitar pedals and electronics, the Torontonian worked his way through the entirety of his four-song, 44-minute LP, In Another Life (which features Ethier and Bejar on vocals). Recreating the album flawlessly, Perri moved between his guitar and mini sound board before bringing out his tourmates to sing their respective parts on the final two tracks. Entering the stage with just a single acoustic guitar, Bejar gave the Ottawa crowd true bare-bones renditions of songs that stretched across his entire discography. Opening his set with a new song he called "Crimson Tide," Bejar reached back to perform "Destroyer's the Temple" from the 2000 album, Thief, and "Goddess of Drought" from 2002's This Night. Looking serious and distant on stage, while only stopping between songs to take a bow and crouch down to grab a drink of whisky (later beer), Bejar finally addressed the room to inform them that he was really "burning through these songs," which found the crowd nervously laughing along. Only playing a pair of songs from ken — "A Light Travel Down the Catwalk" and "Tinseltown Swimming in Blood" — Bejar instead pulled out rarely performed tracks like "Helena," from 2001's Streetheart: A Seduction and "Don't Become the Thing You Hated" from 2004's Your Blues. 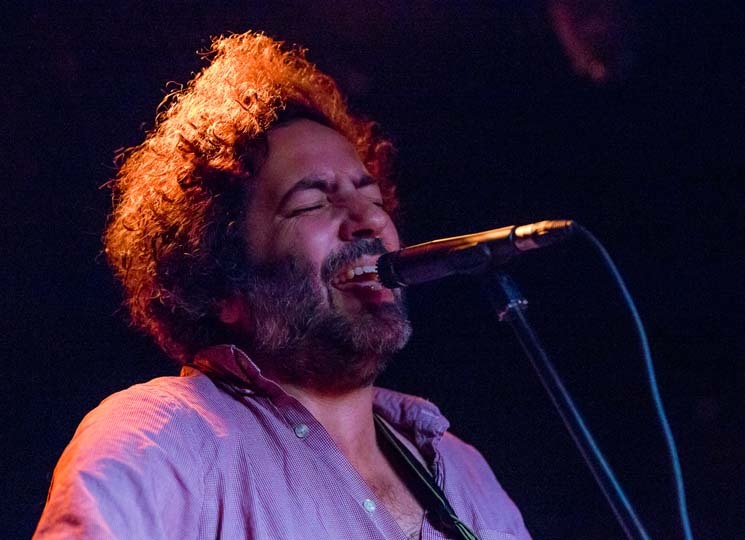 Ending the packed 17-song, 60-minute set with "Virgin with a Memory," Dan Bejar left the crowd with an intimate no-nonsense workmanlike performance that was undoubtedly designed to fulfill every fantasy of long-time Destroyer superfans. Sandro Perri Returns with Off World's Sophomore Album, Premieres "Decamp"